Regular readers will know I am a bit of breakfast-head. If breakfast were a religion I would be proselytising on a street corner, shoving avocado-smeared toast in your hand as you rushed by, late and ratty for your train. In other words, a bit evangelical. Small e, mind. 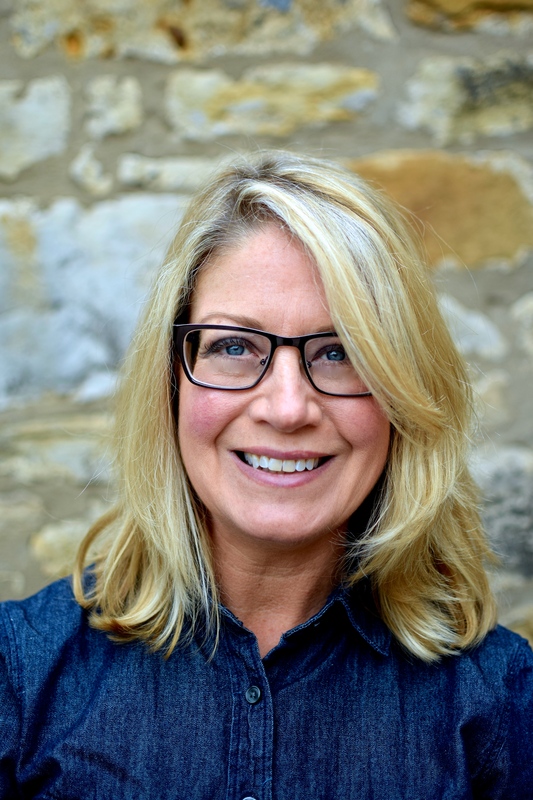 Happily, I’ve noticed in my nutrition groups that when we discuss breakfast and its importance for blood sugar control (and consequently weight control), energy and basically running on all cylinders, I am preaching to the choir. A calm, unratty, insulin-controlled choir. Hooray! Big H.
In the olden days of doing what I do, some folk shuffled uncomfortably in their seats when I mentioned the ‘B’ word. Excuses would come thick and fast, with “no time” consistently top of the list. There would nearly always be someone quite proud of not breaking the fast; a sign, they thought (I may be doing them an injustice), of being far too busy and high-minded for something so basic: “A coffee is all I need.” These would invariably be the ones who would catch me on the way out and complain about their rock-bottom energy levels, their mysterious weight gain, their compulsive cravings. The temptation to roll my eyes and scream “aargh” was at times nearly overwhelming. But I am still here, still teaching, so I have obviously not succumbed to that job-wrecking, pretentious posture. But smoothies are not often a good choice. Or at least not in the amounts many of us like to consume them. The calories and sugar from commercial smoothies more often than not border on the unhealthy. That may sound a tad drama queen, but have you looked at one of the labels? Some make full-fat cola seem a reasonable alternative. What we are now finding out about sugar highlights just how appalling are many of these so-called healthy choices. But still the healthy image persists. A serving size of a commercially made smoothie is usually listed as 250 ml, but with two-thirds of brands containing more sugar than the same amount of Coca-Cola, that’s a load of sugar for which we haven’t bargained. And if poured from a larger carton, who stops at 250ml? Especially as, like granola, it has a health halo: it’s healthy therefore we can/should consume more. Err, no. A calorie is a calorie, and a gram of sugar is a gram of sugar, whether it is from a thick mulch of sweet organic fruits or a pack of M&Ms. I’m not saying that the organic mulch isn’t beneficial in many ways – some fibre and the vitamins – but it is easy to get carried away with the benefits and not realise that your body doesn’t really discriminate when it comes to breaking down sugars. Less is more. 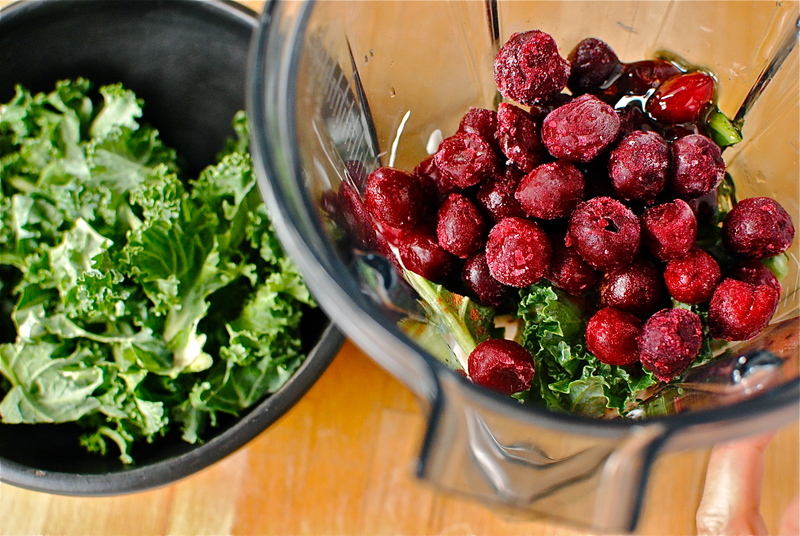 Adding in some greens goes a ways towards justifying a halo – yours and the smoothie’s. Super-low calorie, high nutrient, fibre-loaded kale is a fantastic, if unusual, way to rescue the image of the smoothie. I have a couple more healthy smoothies lurking in my messy, rambling recipe index, but this one is probably my current favourite. I don’t drink it every day, but it is a pretty good way of getting some veggies in before you even go out the door. Why save kale for dinner? If you are at all sceptical about kale in this smoothie, just forgo it – it will still be healthy. But, come on, I dare you! Do you like smoothies? How do you make yours healthier? 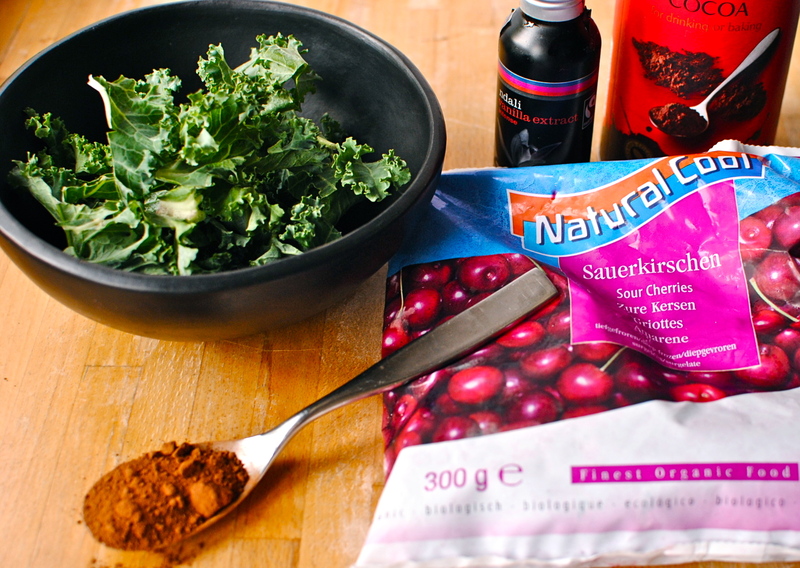 With or without the kale, this creamy cocoa-cherry smoothie makes a terrific breakfast. And the sour cherries are a top anti-inflammatory food. I use frozen, but if you can get hold of fresh, use those and add in some ice when blending. Or use frozen kale. My Miss R always makes sure I have unsweetened almond milk and Katy Rodger’s plain yogurt in the fridge, so that’s what goes in mine. But use what you like – vegan or not. If you are feeling fancy, why not add some chocolate chips or cocoa nibs? But you are best using a Froothie Optimum 9400 Super Blender or other uber-whizzy blender for these nubbly option. Extra energy option: add ¼ tsp matcha powder (green tea powder) for a gentle caffeine hit. I am sending this odd creation over to scare Mark and his readers over at Javelin Warrior’s Made With Love Mondays, found on Cookin’ W/ Luv. THanks so much for both lovely comments! 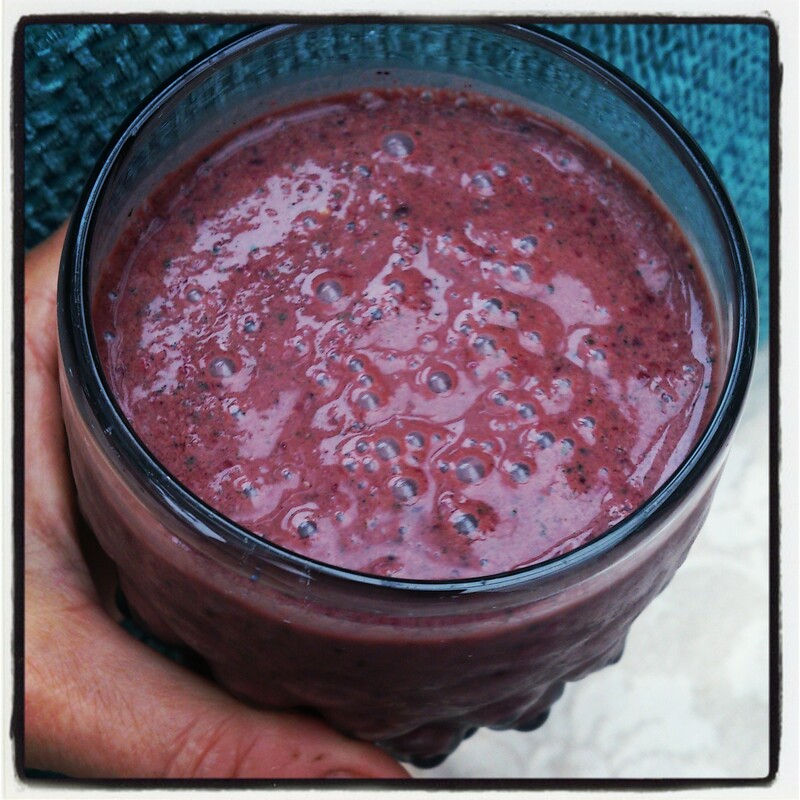 Hi Kellie – I love your smoothie and recently posted a similar one as well. 🙂 I like that you pointed out the sugar in fruit is still sugar and that a balance of greens:fruit ratio in smoothies is important. Thanks for another inspired and accessible recipe! This looks delicious and so does Miss R! Definitely going to try this! Buying ingredients as I type. 🙂 Thank you! Awesome! I hope you like it. Loads of other kale recipes in the index. I too am an evil monster without breakfast, in fact I’m pretty grumpy whenever I am hungry 🙂 have never tried kale in a smoothie, so thanks for the idea. Oh, that’s funny because I kind of think my stuff can look a bit ghost buster-ish. I will never be a food stylist or photographer and I am always so tickled when anyone likes the presentation or images. So thank you! This look delicious. I am ashamed to admit, I am one of the “bad, skip breakfast more than I should” group. I have never been a big smoothie lover, however this might just change my mind. Thanks, Tracy. What a great recipe. I am trying to encourage my husband to eat kale and to eat breakfast. This will do both! I can’t wait to try it. I would just add a little in the first instance. Gain his trust, then *pow* hit him with a proper serving. Loads of other kale ideas in the Index. Good luck! I used to NEED breakfast before I can function, but lately have gotten into a very bad habit of skipping breakfast because I’ve started working, and can no longer have the luxury of rollign out of bed at 9am. I always get so tired before lunchtime though- a sign that my body needs more than just some water to function. This smoothie is a great idea! So nutritious and quick enough to make – I have no excuse now! Where do you buy frozen sour cherries from please? I’m in Edinburgh and buy mine at Real Foods. Otherwise health food stores, enlightened farm shops and places like whole foods should have them. Sweet cherries are good too and more easily available. I love sour cherries for their anti-inflammatory properties and lower sugars. Oooh, try the kale! You will be pleasantly surprised, but only if you have some to hand. Kale is one of the few things I can successfully grow, so I pretty much have some year-round and stick it any thing given half a chance. Delicious. Can’t find my earphones so can’t listen to the track (yet). No doubt it will live up to Miss R’s usual fine taste :). 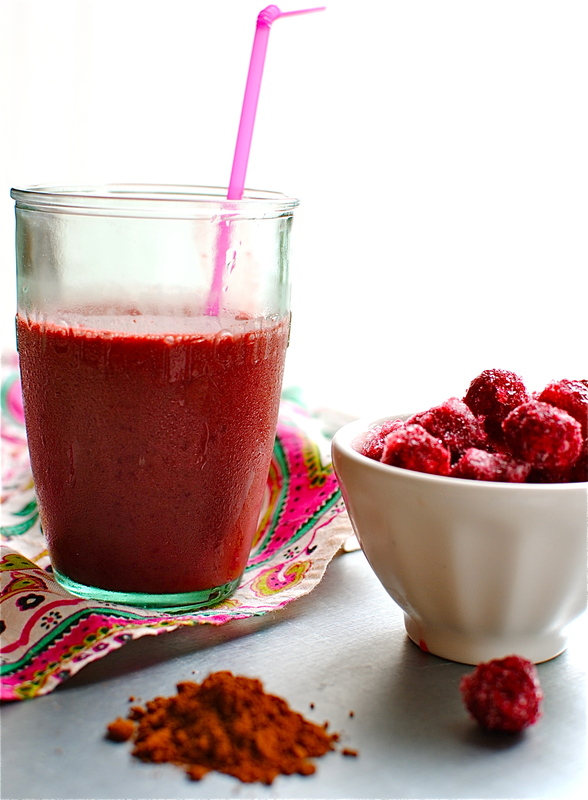 I love smoothies – this looks fantastic! Looks so fun, I love smoothies cause they give me so much energy even when I don’t feel awake enough to eat something heavy 🙂 Great pictures too, super cute! We don’t have Kale in Spain. (Malaga) Substitute? That’s too bad ’cause it’s great stuff. Spinach is a usual sub, but it’s much milder. Some might prefer its mildness. Give it a go and let me know how you get on.